The Prince of Wales Hotel in Waterton, Alberta January 7, 2018. Closed for the winter months. It was named the Prince of Wales Hotel to get the then Prince of Wales, later to be known as King Edward VIII, to stay there during a Canadian tour he was on at the time. It did not work. He stayed at a ranch instead. He might have had a better time at the ranch. 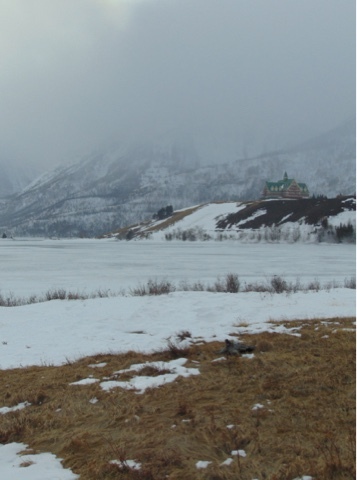 Waterton can be a very windy place. Steve at his blog mainly posts about grain elevators and trains. One of his posts was outside the norm for him. I have went back and read it several times because of what he brings up. I believe everyone at a certain age, time, and place reflects back on life. Steve asks "What will your legacy be?" and takes it a little bit further. It is a good question. I am not sure if I have much of a legacy if any. I think one way we like to make our mark is to build or create something that will outlast us or leave an impression on others. I am in the process of getting divorced, I am single, and have no children. My wife at the time and I wanted children, it never worked out. I will have no descendents and I have yet to build something of any consequence. The number of people that know me well is kind of small. Upon review I have nothing of real importance to pass down to someone. I am not bothered that I have no legacy larger than my immediate self that will be noted. When we look back some of us find we do not always accomplish what we thought we would or be where we thought we would end up. On the other hand I have never been on the wrong side of the law, I have tried to help people when they needed it, did my best to improve myself, and tried to have a positive impact and leave my corner of the world a better place. Sometimes that is enough. On the the other hand the future remains unwritten and I remain optimistic that I may yet create a noteworthy legacy. Othodox Churches look proud and impressive. I get the feeling that they are built to make the point, this is a monument to God. The building makes a statement. 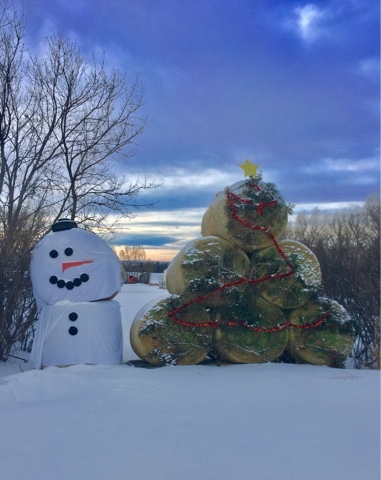 Near Andrew, Alberta December 31, 2017. My page views took a serious hit. Maybe another post will help. Wandering around the countryside on January 14, 2018 because I do not have a life. The first photo is the original. The other ones are where I was playing with a few photo effects. I gained another follower. I better give this new follower a reason to follow this blog. I think it is Plainfield School. 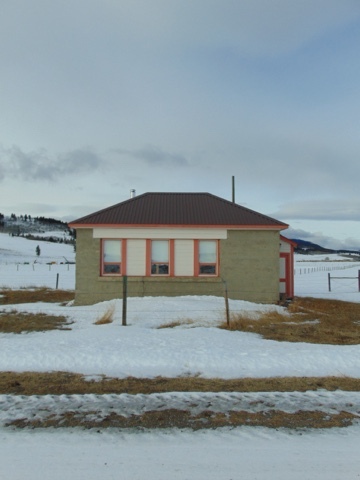 It is not in its original location. 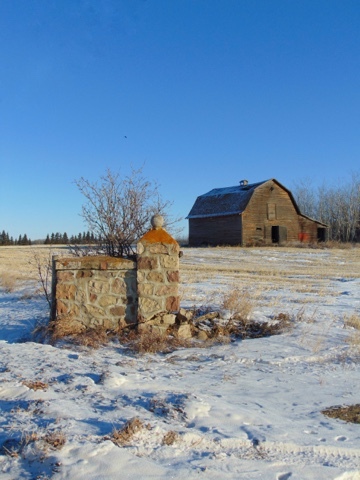 I know that because there is a school marker at the original location and a book on old schools in Alberta says it was moved after it was no longer a school. 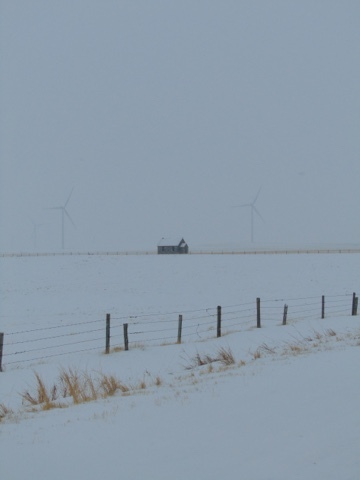 This is in rural Vulcan County on January 14, 2018. Plainfield School was moved to a farm not far from where it once stood and it seems to fit the bill. In the background you can make out a giant windmill on either side off in the distance. It was snowing steadily with some fog. It is on private land. I would really like to get access and get a closer look. I suspect it was once used as a residence however there are no buildings around it. This is kind of rare, you do not see many old buildings like this anymore. 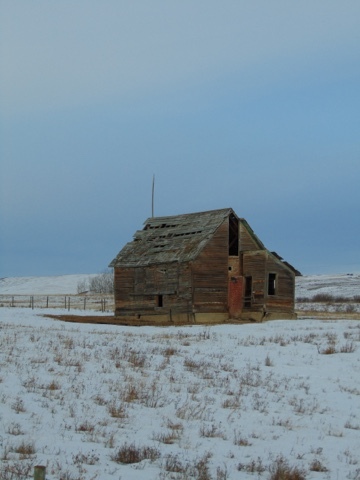 Out doing a little exploring west of Nanton, Alberta on January 7, 2018. The sign needs a bit of care. 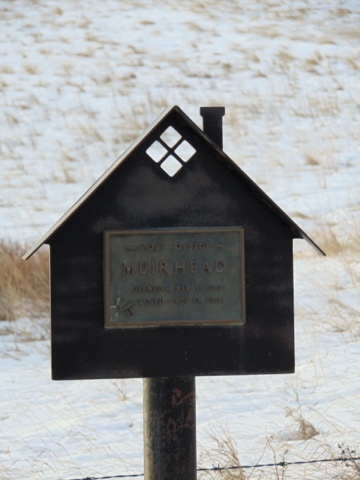 It marks where Muirhead Post Office was from 1912 - 1951. 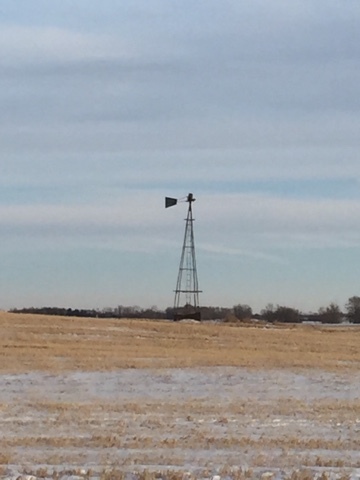 You see quite a few of these style of markers in this part of Alberta. 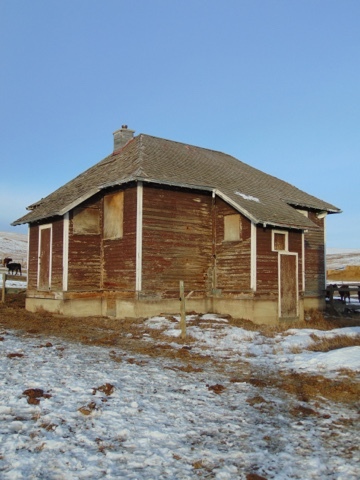 Usually they mark where a one room school once stood. This is the first Post Office marker of this style I have seen. 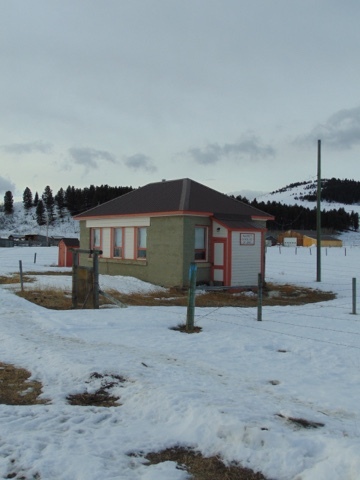 At one time a post office was fairly important. Now I cannot remember the last time I was in one. Futher down this road a building sits in a farmer's field. This happens to be what remains of Muirhead School that operated from 1910 - 1948. Nothing is in the area now except for farms. The school is definitely in rough shape. Glad I got to see it when I did. Having a few issues with publishing posts. Not to mention there are a few issues when I am trying to comment on other sites. I read several blogs on a daily basis. I do not always comment and a few times I have been unable to post a comment. Hopefully this sorts itself out. Part of an abandoned farm. Saw this on January 14, 2018. I own an iPhone, iPad, and an iPod. I used to love Apple but I will be breaking up with them. It is definitely them, not me. In the past I did not mind overpaying for Apple products because they worked with no problems. Set up was easy and they worked as promised. The second iPhone 6 that I own seems to be slow and suffers minor random glitches and freezes. The first iPhone 6 that I owned would seize so badly it got returned to Apple which they replaced free of charge. The constant updates that Apple keeps trying to force on me are not making me happy either. In prior updates I have got apps that I did not want. I have a Blogger App on my iPhone and iPad. You cannot get the app anymore on the Apple App Store as Google pulled it a couple of years ago. Past updates on my iPhone have rendered the Blogger App unusable as it is now incompatible with the updated iPhone operating system. That happened months ago. On my iPad I ceased doing updates ages ago so I could still use the Blogger App. I like transferring photos from my camera to my iPad when I am out and about and then uploading them via the Blogger App to save the post in a draft form. I edit and post drafts later. Now it seems that I can no longer do that on my iPad. iTunes used to be nice and simple to use. Someone at Apple needs a smack upside the head. They turned a nice simple product into something that is a pain to use. I have a little too much invested in my music library to switch everything to something else. The iPad needs to be replaced. I dropped it and shattered the screen about seven or eight months ago. It managed to get resurrected and had a few repairs since then. The replacement screen had to have epoxy to hold in and the repair is now not holding up. I will be buying a Windows tablet. The next phone will not be an Apple product. I only use it for calls (no one calls me), texting (more people text me than call me), email, accessing Google Maps, and playing Scrabble. I currently have a Scrabble game with a fellow blogger who seems to have a serious Scrabble addiction. I am likely not helping by enabling it. I digress, there are less expensive and better phone options out there so I do not feel the need to spend what Apple wants to charge. 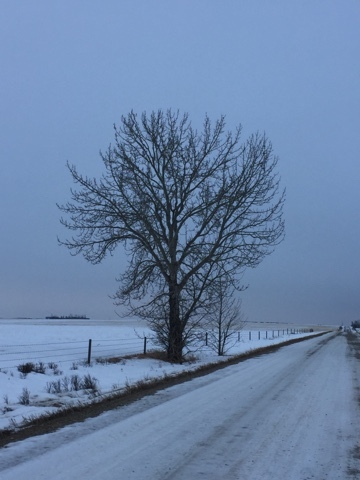 A little west of Nanton, Alberta on January 8, 2018. 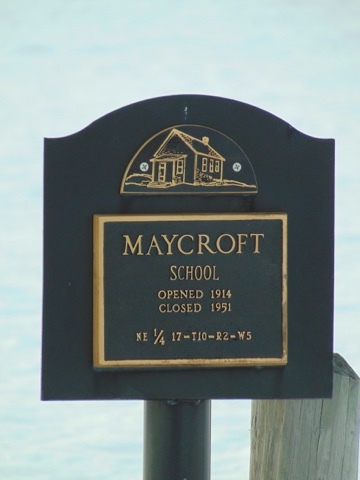 This school is not on its original site. I was on a rural road with a friend who was showing me where this was. We were taking photos of it from the road and a farmer pulled up to feed his cows. He let us come onto the property to get a close up look at the school. He told us back in his younger days he attended this school. He was busy so I did not want to bother him much. The cows were not very friendly. 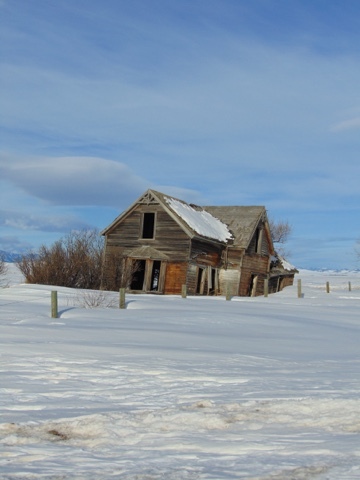 It has been used as a farm building for years and there was nothing of note on the inside. I thanked the guy a few times for letting us get a close look. I never did get his name. 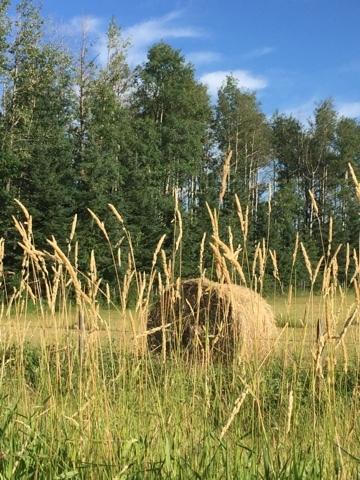 From Longview, Alberta south along Highway 22 is ranching country. 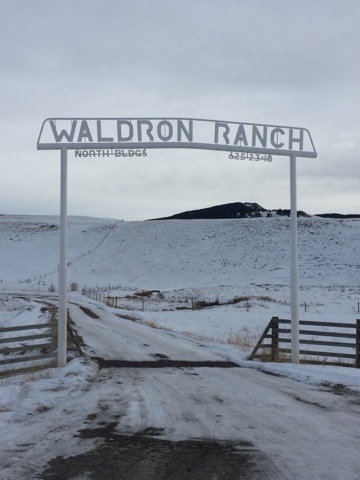 One of the big ones is the Waldron Ranch. 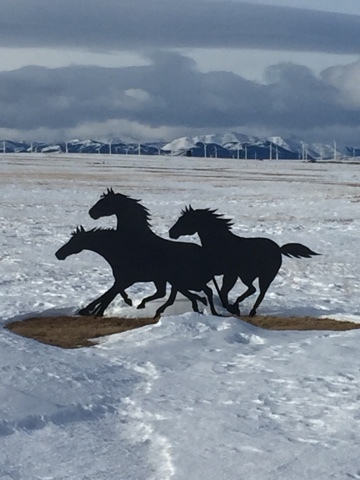 You can see a couple of their gates along Highway 22. North buildings. Access to the south buildings. 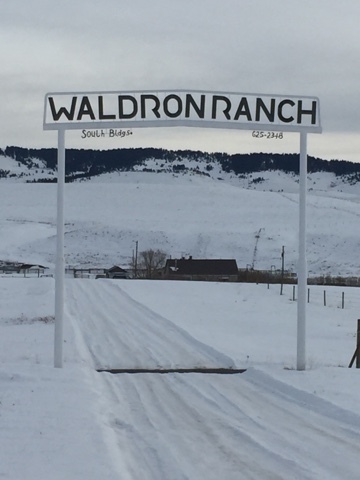 Not that long ago the Waldron Ranch got bigger when it acquired the King Ranch. The King Ranch was owned by two lifelong bachelor brothers, Harrold and Maurice King. 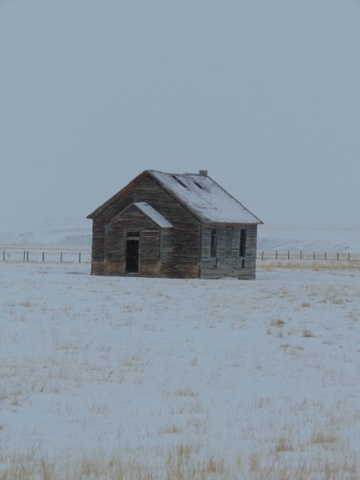 They lived like hermits in very simple spartan lifestyle and owned land worth millions of dollars. They had about 4,200 acres. 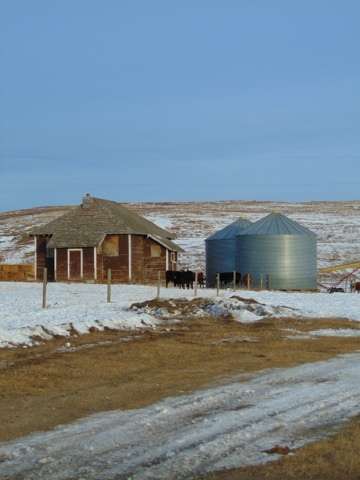 The King brothers started their ranch in 1926. Maurice and Harrold were born in 1897 and 1899. They died in the 1990's. 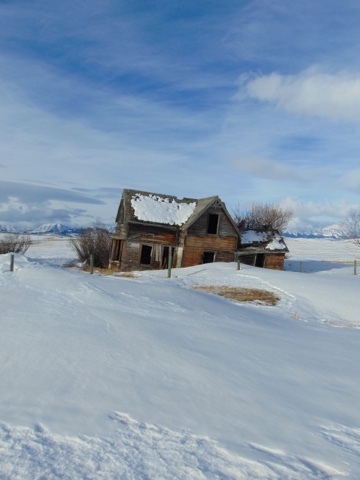 They lived without indoor plumbing or running water. 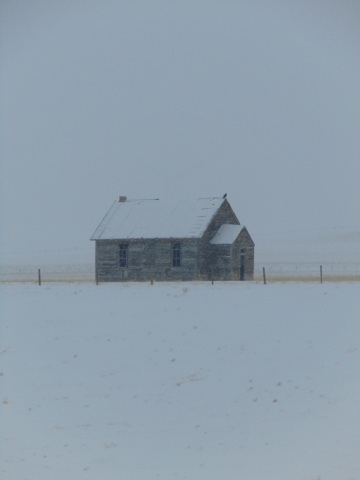 They built a four-room log cabin in a remote valley about forty miles north of Pincher Creek, and that was their home for about the next sixty years. 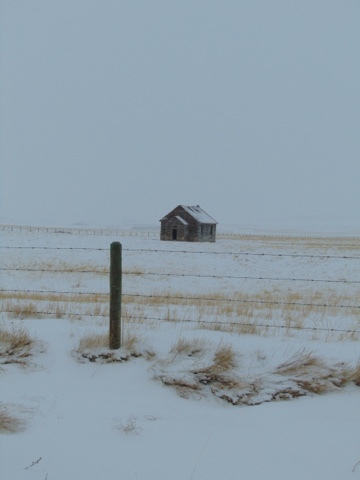 Their small cabin was heated by a woodstove that they also used to cook on. They slept on beds made out of bear hides. The property was sold for about six million dollars when they died. The brothers were not hermits, they did visit neighbours and attended social events. They were well respected. It was well known that banks would stay open late or open after hours to accommodate their visits when they came to town to pick up supplies and do business. 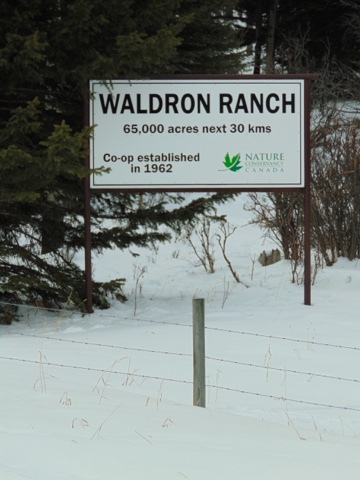 The Waldron Ranch itself is a grazing cooperative covering 65,000 acres. 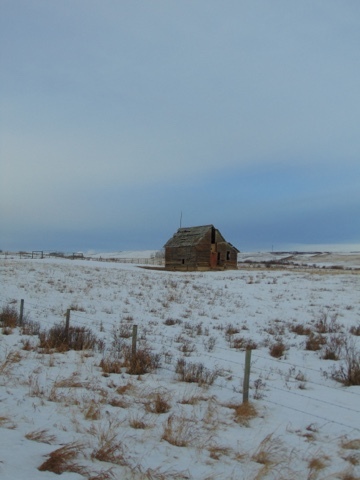 Besides land to run cattle on for its members it also protects and preserves this part of the prairie in Alberta. Nice day, temperature is zero degrees Celsius, the sun is trying to shine and the hills might be alive with the sound of music. A good day to get out and see if there is anything worth shooting with the camera. Except I am off to visit mom for the weekend. Priorities. 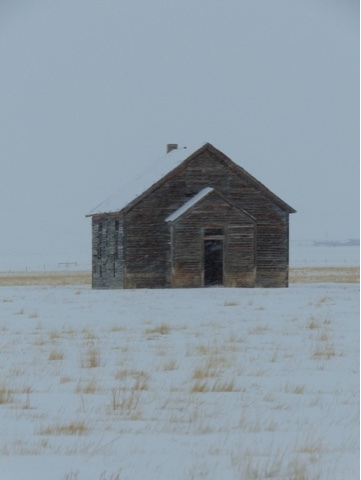 Former one room school in very rural Alberta. It looks like it was made out of concrete which makes perfect sense as this part of Alberta gets some absolutely brutal winds. Used as a community centre when it stopped being a school. Not many people in this area now. Trying to reply to some comments and Blogger is acting up. I do read all of the comments and appreciate that someone takes the time to leave one. 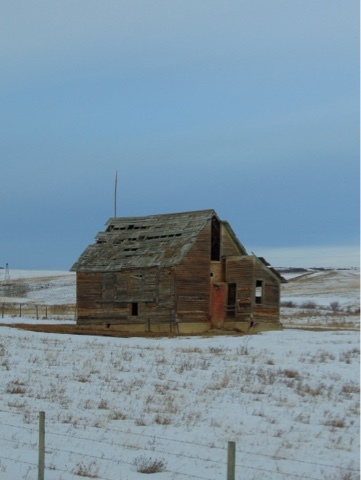 Not that long ago I was on my way to see a client at night at their farm in a rural area east of where I live. When I was writing down the address I transposed two numbers on the location for the township road that this person was on. Instead of driving to number 264131 on the township road I drove to 246131 instead, about twenty miles from where I should have been. Of course it had to be about -30C at the time. Once I got that straightened out I got to the right place about fifty minutes late. I felt very dumb about doing that especially since when I have the right address I am pretty good at finding a place and I rarely get lost. I really dislike being late and I strive to be on time. Being late for an appointment really bothers me. I admit to having some infrequent dyslexic moments and sometimes I really have to watch myself. There are times I can look at a set of numbers and I will write them down with two of the numbers reversed and no matter how many times I look at what I incorrectly wrote it looks absolutely right to me. I once had an instructor in a university class tell me I wrote "backwards" as some of my thoughts on paper seemed to be in reverse order compared to how someone would usually write the same thing. I learned to write and rewrite papers then get someone to proofread them. One of the reasons I sometimes do not write a lot on this blog is that I can write something and read through it several times and it will not look "right" to me. When I was a kid I never told anyone about it simply because I never thought it was an issue. It only caused me occasional minor problems so I never thought about it much. To get better in school and to compensate I just tried to do things to help me get better. My father was one of those "no excuses" types so there was not a lot that I ever brought up to him. I am not blaming him, times were different then. So I tried to improve om my own. I literally read hundreds of books on anything and everything in my younger days. As long as it held my interest I would read it. Biographies and well researched history books are still favourites of mine. A few books I read several times because the first few times they did not make sense to me, the order of what I was reading seemed off. Upon repeated readings they would make sense. I mainly read to see how others wrote and pick up some cues from them and my spelling improved immensely. Reading also expanded my vocabulary and hopefully made me smarter. I was good, sometimes great, academically in school. I was not a very confident student. Writing is something that I am still not all that comfortable doing even though I like to write some stuff for fun. A former aquaintance who knew about my blog told me a few times that when I did write something here it was badly spelled and poorly written. That slightly wounded me. I actually went back and reviewed a number of posts to see if the person was right. Upon review I could not find anything noteworthy to fix. Anyway I might try a bit more writing on this blog. We shall see. The problem with writing is finding something to write about. 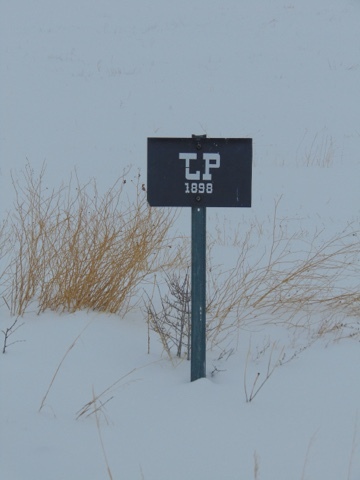 I am guessing that this is a ranch or farm marker. I think above the year 1898 is the brand. 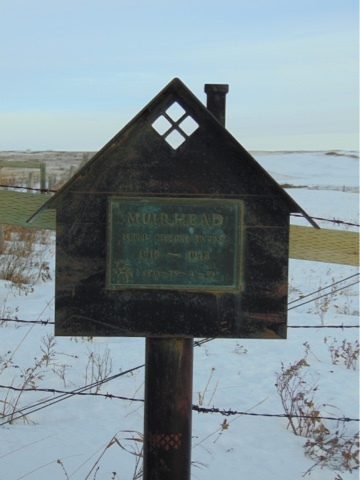 Sometimes you see homestead markers or ranch markers on the prairie. One of those things that is interesting to me and not many others. Found this in a rural part of southern Alberta. Is it better in black and white or in colour? If there are no ups or downs in life that means you're dead. 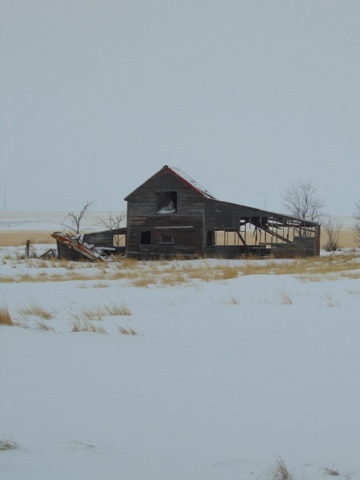 Drove by this with a friend on January 14, 2018 who was nice enough to introduce me to some places in Vulcan County, Alberta. This looks like an abandoned farm. 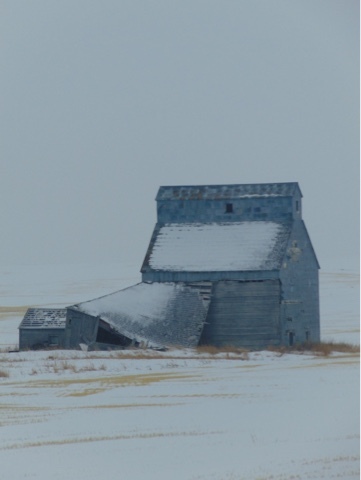 There is what looks like a grain elevator, it is likely a unique one of a kind granary. 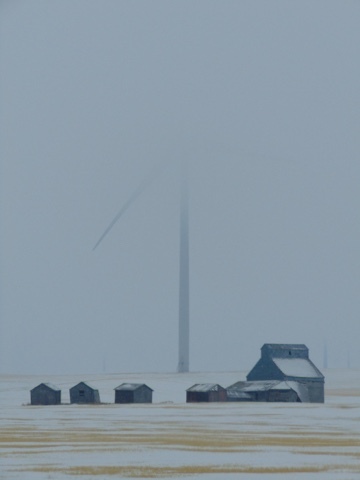 Behind it through the snow and fog is a windmill. These new windmills are huge and there are a few hundred in this area. This is intriguing. If the side road was not covered in snow we would have got a closer look. 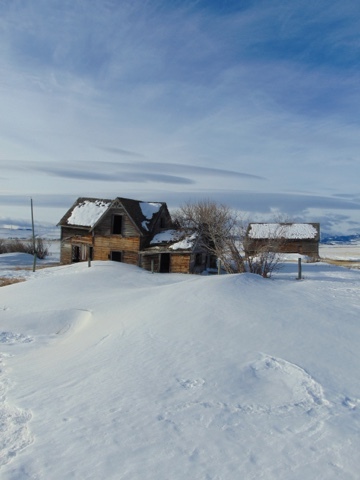 Abandoned homestead near Cowley, Alberta January 7, 2018. My sister made covert plans to visit our mother for Christmas. 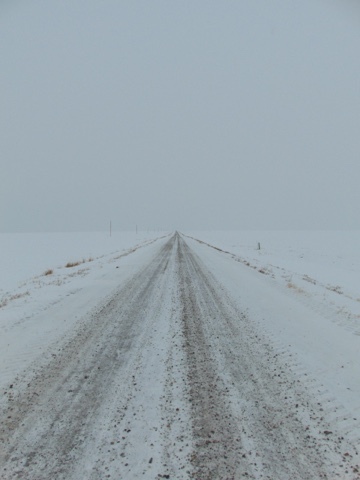 My mother lives about three hours by road north of me. Mom is seventy-six. I think her older sister is eighty. She lives in Edmonton. Her sister lived on a farm for years a little bit north of where my mother lives. She moved off the farm and it was passed down to her son, my cousin who I will refer to as Dave. My aunt's first husband died of a heart attack years ago while working on the farm. Dave was having a family Christmas get together at his place with his family, his sister and her family, and his mother (my mother's sister) was going to be there. Dave is a couple of years older than me. I had not seen him in about five to ten years. The plan that my sister made, then sprung on me later, was that she and I would go pay mom a surprise visit on December 24, stay overnight, and take her to see her sister at Dave's place. Mom talks to her sister on the phone just about every day. They do not get to see each other in person that often. There was only one thing I wanted out of all of this. I wanted turkey. I had made plans to ensure that I was going to get turkey. In fact I guaranteed that I would get turkey. Earlier in December I ordered a turkey from a local caterer and I picked it up fully cooked on December 23. I brought it to my sister's home and my sister, her husband, and her son and I had an early Christmas dinner. The plan from there was that my sister would join me to go north to see mom the next day and her husband and son would visit his family on Christmas Day. It is a given that I would get shafted somewhere. My sister hurt her back leaving me to go see mom. 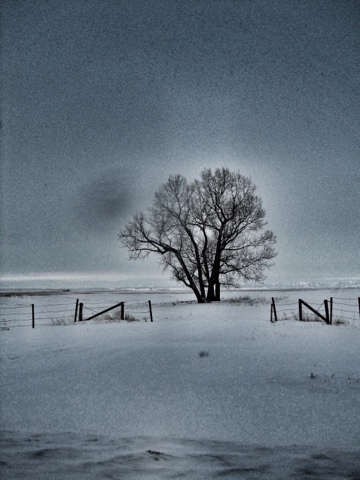 On the morning of the 24th I had turkey for breakfast, threw my travel bag in the car, and headed north. Snow covered roads, icy sections, bitter cold, and four hours later I arrived and surprised mom. She asked what I was doing there as she obviously was not expecting me. I told her I was visiting for Christmas and that I was taking her to visit her sister on Christmas Day. Mom told me she was not going. I smiled the kind of smile that you would see on a Bond villian and politely stated that I did not drive close to four hours in temperatures flirting with -30C and having this prearranged for her not to go. I advised her that she would be going if I had to pick her up and stuff her in the car. This would be relatively easy to accomplish since is a not much over one hundred pounds and about five feet two inches in height. Mom went willingly. She also had a good time, as did I catching up with family, and she thanked me for taking her. Alas there was no turkey at the cousin's place when I was there. The invite was for a Christmas breakfast. When I was taking mom back home, where there was no turkey, she wanted me to take her car out, fill it with gas, and return it. Nevermind this was on Christmas Day. Surprisingly there were four gas station open in a town of eight thousand people. Of course they seriously jacked up the price of gas. I filled it and paid it and put mom's car back. I got back on Boxing Day where I managed to get more turkey. The moral of the story is that if you want turkey plan ahead. Thankfully it warmed up. Just a day prior it was -30C. Yesterday I went through the whole list and I liked most of it. I dropped some money on buying some music. Dennis has a great blog, I enjoy his writing and he loves what he writes about. If you are so inclined go pay a visit to his site. Since people want me to keep posting that means that I have to come up with some kind of content. Keep in mind some days it might not be great content. I was out on the last day of the year in -30C weather and became ill with a flu that night. This barn shot might have been worth it. Still trying to break free from this flu/cold/being podded by the creatures in Invasion of the Body Snatchers. Body Snatchers (1993) is better than Invasion of the Body Snatchers (1978) mainly because I cannot stand Donald Sutherland. 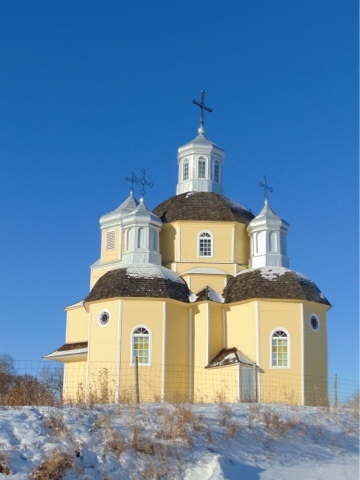 Also known as the Russo Greek Orthodox Church of St. Peter and St. Paul. Construction started in 1909 and finished in 1912. It sits on top of a hill and is still in use. I could have got a few more photos except it was -30C when I was there on December 31, 2017. Pincher Creek, Alberta January 7, 2017. A row of windmills are in the background against the Rocky Mountains. I really like visiting this page just because the author is so crafty. I wish I spotted this before Christmas. I happened to see this north of Red Deer, Alberta on New Year's Day. Maybe I should post something . . .
An interesting start to the year. 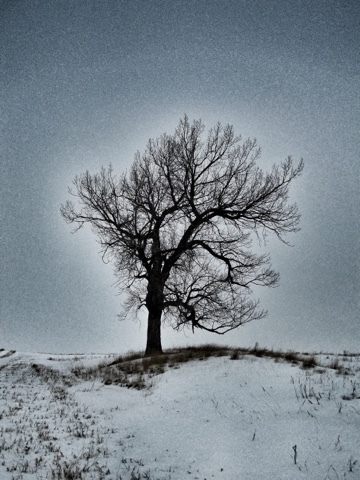 There was some horribly cold weather New Year's weekend here in Alberta. Temperatures -30C and colder are never any fun. It is much nicer now. December 31, 2017 I happened to get hit by the flu and spent the evening experiencing cold sweats. I came into work even though I should have stayed home. Everyone at work is sick as well. On the plus side I have lost weight being sick. A liquid diet will do that. Being sick plays with your thoughts and dreams. Or it does to me. For some reason I dreamt about the fact that years ago I rented the movie "Into The Night" on three separate occasions and never watched it. I have yet to see it. I woke up in the middle of the night a few nights and could not get back to sleep. I ended up reading articles on the internet on topics ranging from Jimmy Durante to Mr. Wrestling II. The things you do to try to get back to sleep. 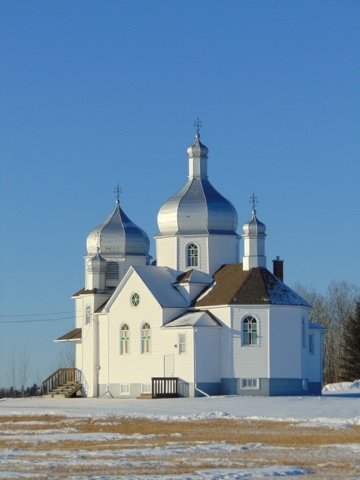 As an aside, I used to live in a small town in northern British Columbia many years ago. For some reason we got television station TBS out of Atlanta, Georgia that had a lot of dubbed Japanese programming and Georgia Championship Wrestling where I saw Mr. Wrestling II. I never saw Jimmy Durante in anything. NyQuil is vile but it works for me. I pay no attention to the recommended dosage. I take it until I stop coughing. Of the two flavours, green and red, green is the more palatable. Why you would make a cold/flu medication in the same colour as phlegm escapes me. NyQuil supposedly makes you drowsy. It usually keeps me awake. Speaking of work the place where I am employed was sold and the new owners took possession on December 28, 2017. There was no change in staff and I am doing the same thing I have done before. I am reserving judgment on this change as I am not sure what to expect. I have not had enough interaction with them to feel if I am comfortable with them or not. I am still trying to figure out what the new owners and management are all about and what they want to accomplish. Details have been a little vague. A few people have let me know that they want me to keep posting. I likely will, I doubt that I can maintain the past pace of an originaly photo post a day. The other problem is that I upload stuff as a draft post and clean it up and post it later when I am at the office. I may not be able to get away with that in the future. A daily post was starting to get difficult since I was using my material and I am also not that interesting. By the way it was nice to hear from those who said they missed me. I currently face 2018 with no debt, some money in the bank, my account with my lawyer is in the black, and I have a trial date for my pending divorce later this year. The legal fees should take care of the no debt part in due course. My wife had me served in March of 2014 and never followed up with actually divorcing me. I forced a trial date and I will have this resolved one way or another later this year. Posts from here on will be when I can post something. It has been an interesting 2017 and I wish you all a stellar 2018. This blog may have run its course and it's purpose may have been realized. This may be temporary, it might not. We will see what the morrow brings. Maybe I just need a short break. Too many personal things to clear off the plate. South of Buck Lake, Alberta July 25, 2017.